Bigheads viewers were howling with laughter tonight after a “German immigrant” in a Boris Johnson head ran around with his pants down. The Foreign Secretary shuffled around in a nightie while attempting to avoid a massive shark in ITV’s new Sunday night gameshow. Jason Manford hosted proceedings as members of the public attempted a series of challenges while wearing giant celebrity heads . Boris was ultimately captured by Snapper the shark, missing out on moving to the next round, in the “nonsense but hilarious” programme. In a change from the norm, the member of the public inside the amazing Boris head did not reveal himself, but admitted he was a “German immigrant” from East London. Eight competitors were transformed into some of the world’s most famous celebrities, including Sir Elton John and Winston Churchill, to compete in It’s A Knockout-style games. The presenter was joined by commentators Jenny Powell and Chris Akabusi, who couldn’t contain their excitement from the sidelines. Ed Sheeran battled it out with Prince Charles and Rihanna, but he was swept off his feet by a powerful microphone, leaving the live studio audience in tears of laughter. It came down to a neck-and-neck finish but Rihanna defeated her fellow singer and eventually made it through to the grand finale. 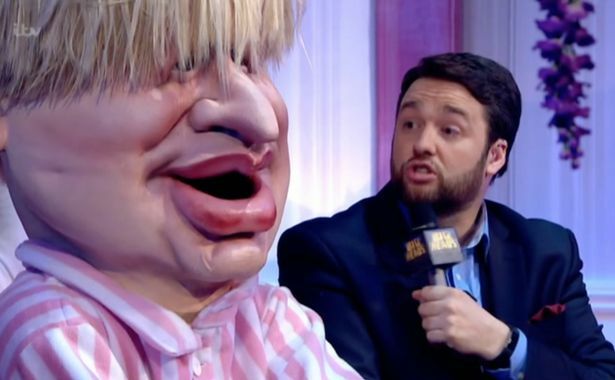 Viewers took to Twitter in their hundreds to admit they found Boris on the silly gameshow hilarious.